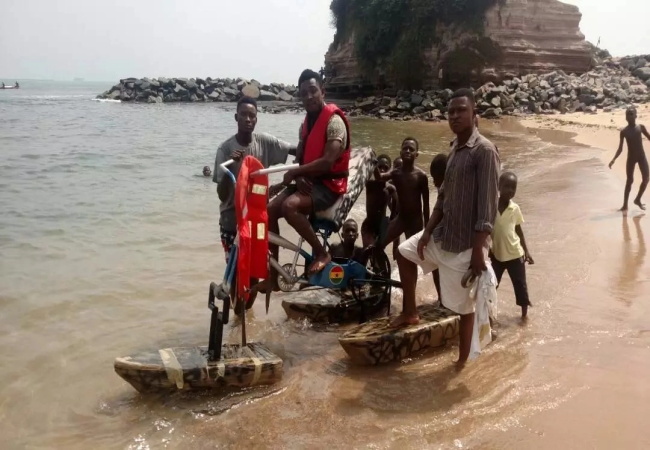 A few months ago, We reported the news of an encounter with a young Ghanaian inventor known as Frank Darko who had created a bicycle that could move on water. 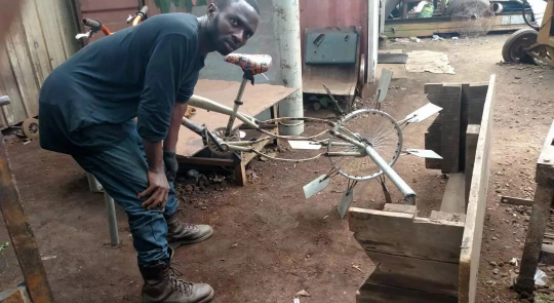 The 27-year-old Ghanaian who resides in Takoradi in the Western Region gained recognition for his creation of a bicycle which is purposely designed to be used on water surfaces. He revealed that the creation of his invention started in August, 2017 and with a lot of effort and hard work, he managed to finish his project and tested it in a shallow dam in his area. Now, the young inventor believing in his finished work, decided to test it out on the sea to prove to the world that his invention has come to stay. In the many pictures that the young man sent us, some people were seen taking turns to experience the unique invention. Speaking in a telephone conversation, Frank Darko revealed that he wanted his invention to help the school children who had to swim to school, find an easier path to their classes. This fact notwithstanding, he revealed that many individuals have also requested to have him make a copy of the bicycle for them.He said he wanted to contribute to the development of Ghana with his invention. He called on stakeholders and benevolent bodies to invest in his breakthrough invention so as to make the lives of many Ghanaians easy. He was a final year student at the Takoradi Technical University formerly known as Takoradi Polytechnic pursing a course in Graphic Design but deferred in his final year in school due to personal reasons. The young inventor revealed that the special bicycle is his first invention but he had drawn up plans for many more mind blowing ones to come.